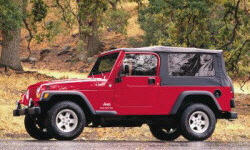 Jeep Wrangler Pros and Cons | Page 1 of 3 | Why Not This Car? 2013 Jeep Wrangler Unlimited Rubicon - a hit or miss vehicle. Amazing capabilities no car can do and unique features that no car or truck can ever have. Position is much higher for a smaller sized SUV. Jeeps are Jeeps, but make sure you've got a great dealership. Like being up high, removable top. I know that I can go anywhere at anytime with this car. It fires up, handles well in rain, sleet, snow, ice, dry, on road and off. Lame engine. Strains going up long grades on Interstate with A/C on, merging and passing is also frustrating. Uses a lot of gas. Looking forward to new Pentastar engine for 2012. 4 visits to dealership over 6 months trying to solve "death wobble" problem. Over $2,000 worth of work done (covered by extended warranty), including completely rebuilt steering assembly, etc. Still did not fix problem. Traded in at 50k miles. The old AMC inline six pulls like a freight train regardless of gear and can be lugged down way below idle speed off road without fear of stalling. It can be rather loud at highway speeds with the top down - forget about answering a cell phone call. Seating height is commanding and visibility is excellent, with nearly no structure blocking vision out of any side. Distinctive Jeep styling, not much else looks like it on the road now. No bones about it, American icon 4X4. Traditional Jeep styling. It still looks like it can take on the world. The look is almost unchanged after 60 years. rugged. 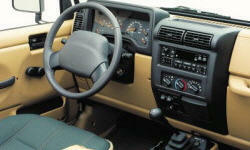 Past vehicles have proven to be very reliable and rugged. Fun to own and drive. A stock jeep can do astonishing things off-road.